Whisper of the Heart, or Mimi wo Sumaseba, is a Studio Ghibli film produced by Hayao Miyazaki (he also wrote the screenplay), but it was directed by Yoshifumi Kondo and is based off a one-volume manga by Aoi Hiiragi. The anime is about a young girl and boy who end up falling in love, with the focus on the girl, Tsukishima, learning things about herself and love. I really liked this film a lot. The story and characters are endearing and fun to watch, and will put a smile on your face. 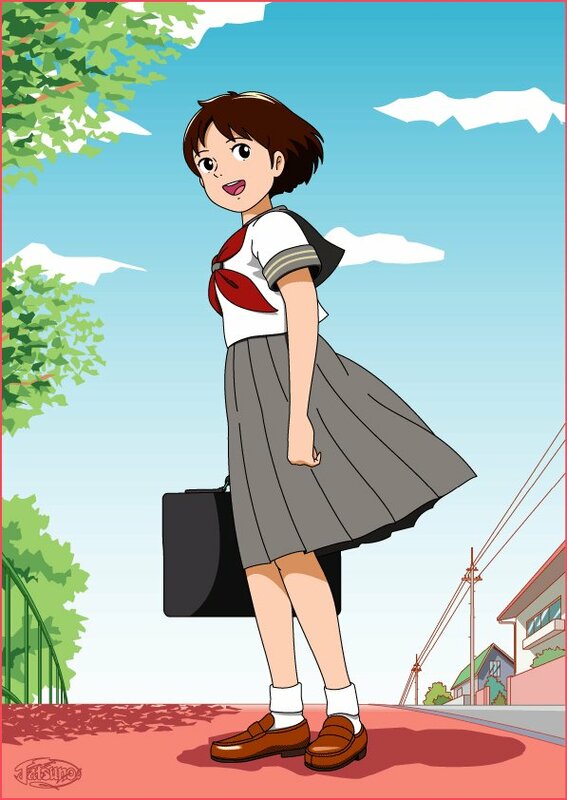 Tsukishima has an adventurous and bold personality, with just a bit of soft little-girl-femininity. She has a quiet determination, and looks at the world with her own unique perspective. It's a perspective that includes the sort of magic and imagination a young child has, coupled with moving into the world of adolescence. This lets things serve a purpose in many different levels. For example, the Baron could be alive and just pretending to be a statue, and then later on takes on a much deeper meaning for both Tsukishima and Shiro Nishi. I was a little surprised at the score used during the film, the first time it popped up. It's not conventional. It has some electronic influences, in a film that doesn't really have that mood. But it works, and after a while it feels right. I think that has a lot to do with the colorful and lively attitude of exploration and excitement than Tsukishima's character portrays. Among the other Studio Ghibli films, I think Whisper of the Heart is closest in feel to Kiki's Delivery Service. I just thought I would mention that, because this film did remind me of Kiki in a lot of ways. There's also a nice little reveal during the closing credits, if you watch closely. I thought it was a really nice touch that showed just how much the people involved care about the characters.